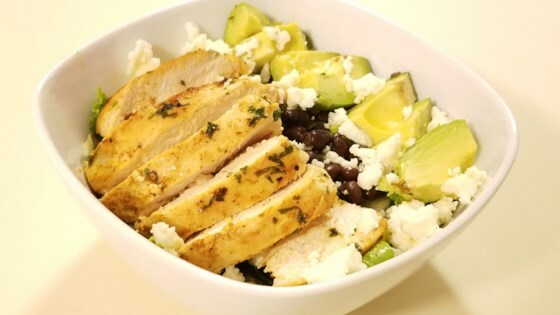 "This is a highly seasoned salad that is a nice change from the typical 'taco' version. Even my kids and their friends love it!" In a covered jar, mix the lime juice, olive oil, salt, garlic, cilantro, chili powder, and cumin. Cover, and shake until well blended. Place the lettuce in a large bowl. Toss with the chicken, black beans, onion, and tomato. Just before serving, toss with the dressing mixture and Parmesan cheese. Serve with tortilla chips, either crushed over the top of the salad, or on the side. Really looked forward to this, yet just so-so. We all love love love this receipe. You can serve it so many ways...over tortilla chips, as a wrap in bread as a sandwich, taco salad filling.........thanx so much! This was a hit at dinner. Added a little more lime juice and sea salt. I added some corn as well. Next time I will add olives & red peppers.